Following graduation served as a pilot in the USAF and Air National Guard from 1956 to 1963. Worked at MIT, as a research scientist in the Experimental Astronomy Laboratory until selection by NASA. Perormed first extravehicular test of the Apollo PLSS(Portable Life Support System) during the Apollo 9 mission in March 1969. Following the Skylab program, moved to NASA Headquarters in Washington D.C. as Director of User Affairs in the Office of Applications. Later assistant to Governor Jerry Brown as a science and technology advisor in California. 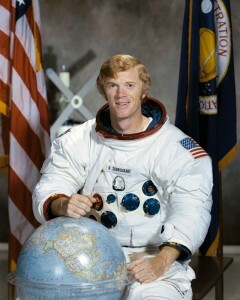 1979, retired from NASA and named Chairman of the California Energy Commission. Later, President, Aloha Networks Inc., then President, NRS Communications Inc. Currently Executive Vice President of CTA Commercial Systems. 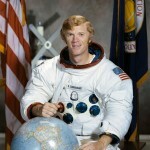 Founder and Past President of ASE (the Association of Space Explorers).